$44.99 & FREE Shipping on orders over $59. Join in on the Cider making craze with a super easy to make Cider Kit. A sweet apple base combined with a refreshing burst of summer berries including delicious raspberries and blackcurrants. Serve over ice! These kits are tasty uncarbonated, but add some bubbles and things get even better! We recommend a pack of Carbonation Drops to help give this cider a carbonic kick! 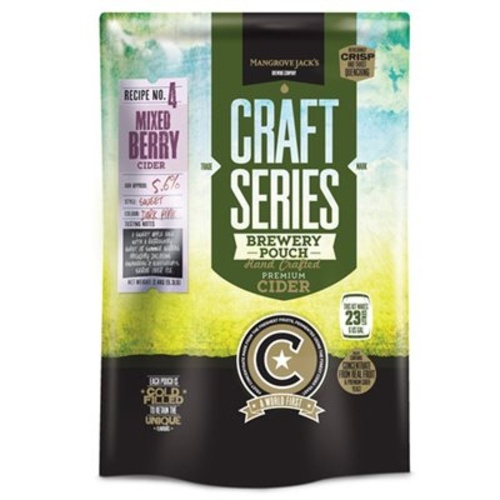 Mangrove Jack's cider varieties are formulated with only the freshest and best quality fruit which is then pressed and concentrated using state of the art evaporators, and then cold filled into a pouch. This ensures we preserve the natural flavor of the fruit, giving you cider which is fresh, crisp and especially good on a hot summer's day. Please Note: You will need atleast 2.2 lbs of Dextrose for this kit as well. See our You Might Also Need Section below for products. Exploring cider making and like alternatives to pear and apple. Nice easy kit, tastes great. A nice semi-sweet summer cider. Easy to make kit and cider came out great. When I got my first kit, I did not realize there is a dry pocket in the foil pack with yeast and instructions. That is nice packaging. I did not realize I needed 2.2 lbs of corn sugar so had to wait to order some. Came out great last summer so I’m fermenting another batch now. Great kit that I messed up. I totally forgot the "mixed berry" part of it, which comes as a flavor concentrate to add in after fermentation is done before bottling. But I still got a great sparkling cider out of it. Be warned that the yeast gives off a bit of sulfur if fermenting in an enclosed area.